Police said the arrested men, Muthuraman and Francis, were drunk. A senior officer said the incident was reported after 9 pm. While Muthuraman is a BJP worker, his friend Francis belongs to a Communist party. Hours after Tamil Nadu BJP leader H Raja said statues of Dravidian icon E V Ramasamy ‘Periyar’ “will be brought down”, two men were held in Vellore for allegedly vandalising a Periyar statue Tuesday. Police said the arrested men, Muthuraman and Francis, were drunk. A senior officer said the incident was reported after 9 pm. While Muthuraman is a BJP worker, his friend Francis belongs to a Communist party. His remarks invited strong criticism from different political groups and he later deleted the post. Periyar, founder of the Dravida Kazhagam party who had also led the self-respect movement, is revered in Tamil Nadu, irrespective of political affiliations. Reacting to Raja’s statement, DMK working president M K Stalin demanded his arrest. 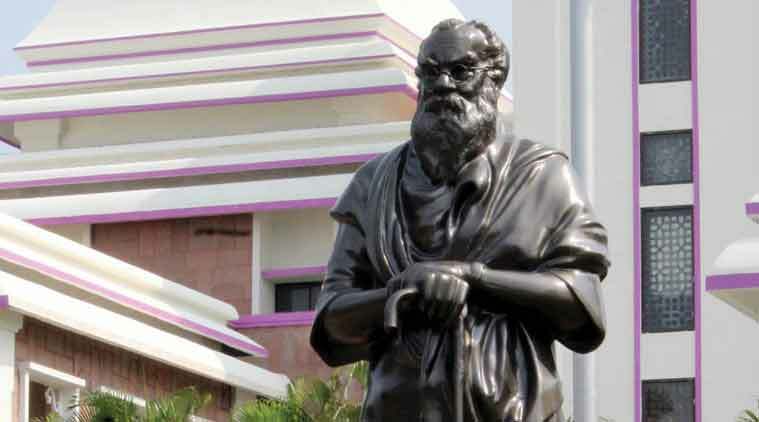 “Nobody has the right to touch Periyar’s statue. He (Raja) has been doing this for a long time to incite violence. He should be arrested under Goondas Act and put behind bars,” Stalin said. “Forget about Raja, not even his forefathers would have been able to touch Periyar’s statue,” said Dalit party VCK leader Thol Thirumavalavan. Naam Tamilar Katchi leader Seeman said it has become routine for Raja to make such statements to draw attention. “Let him touch a Periyar statue, we will see then,” he said. The Tamil Nadu BJP distanced itself from Raja’s remarks. BJP state president Tamilisai Soundararajan said: “His statement about removing Periyar statue was his personal opinion.” The BJP, she said, also had no role in destroying Lenin’s statue in Tripura.